Christopher George Latore Wallace (May 21, 1972 – March 9, 1997) was an American rapper. 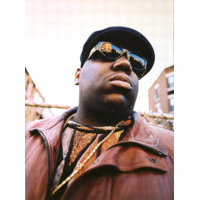 He was popularly known as Biggie Smalls (after a character in the 1975 film Let's Do It Again), Big Poppa, Frank White (after the main character of the 1990 film King of New York), and by his primary stage name The Notorious B.I.G..Wallace was raised in the Brooklyn borough of New York City. When Wallace released his debut album Ready to Die in 1994, he became a central figure in the East Coast hip-hop scene and increased New York's visibility at a time when West Coast artists were more common in the mainstream. The following year, Wallace led his childhood friends to chart success through his protégé group, Junior M.A.F.I.A.. While recording his second album, Wallace was heavily involved in the East Coast/West Coast hip-hop feud, dominating the scene at the time.On March 9, 1997, Wallace was killed by an unknown assailant in a drive-by shooting in Los Angeles. His double-disc set Life After Death, released 15 days later, hit #1 on the U.S. album charts and was certified Diamond in 2000 (one of the few hip hop albums to receive this certification). Wallace was noted for his "loose, easy flow", dark semi-autobiographical lyrics and storytelling abilities. Since his death, a further two albums have been released. MTV ranked him at #3 on their list of The Greatest MCs (Rappers) of All Time. He has certified sales of 17 million units in the United States.